Have you ever noticed how politicians answer questions? Most of them will not give a straight answer. One of their tricks is to talk around a subject for a while, but when they are done, they have not said anything. Another trick is to answer a question with, “No comment.” It is as if they have a natural tendency to plead the fifth amendment regardless of the circumstance. Why would someone try to shun an answer and keep a matter shrouded in silence? Why would one not want it to be known where he stands on a question? The most common reason is the fear of opposition from those who may not agree with the stated view. The safe road to avoid taking a stand is to stay quiet or issue a disclaimer to signal neutrality. The recent efforts to speak plainly on the immorality manifesting itself in our local schools have shown this tendency by some in our community. Very few seem ready to boldly oppose immoral teaching and practice even when they agree that it is immoral. They do not want to offend others. It seems the majority of those in places of influence are more concerned with covering up problems rather than correcting them. The disclaimer put on our article in the newspaper was an amusing example of this to me. Instead of taking a stand one way or the other, it was deemed safer and more politically correct to state their neutrality. The fact is that there is no neutral ground with morality and service to God. We are either for the Lord or against him (Matt. 12:30). In Bible times, there were those who refused to take a stand for God and his truth. They were always condemned for such cowardice. It was the people of courage who dared to stand against the views of those in places of power who God approved. Elijah was a man who stood in opposition to the wicked ways of King Ahab and his wife, Jezebel. Ahab and Jezebel had introduced the idolatry of Baal to Israel with all of its associated evils. Elijah stood against that system and urged others to oppose it as well. When Ahab came face to face with Elijah, the king’s first words were these: “Is that you, O troubler of Israel?” (1 Kings 18:17). Elijah replied, “I have not troubled Israel, but you and your father’s house have, in that you have forsaken the commandments of the Lord, and you have followed Baal” (1 Kings 18:18). This man of God rightly understood that the one standing for truth was not the cause of trouble. Those who disobeyed God were the reason for problems and the resultant division. And Elijah came to all the people, and said, “How long will you falter between two opinions? If the Lord is God, follow Him; but if Baal, then follow him.” But the people answered him not a word (1 Kings 18:21). It was a fifth amendment crowd who feared the king more than they loved the truth. However, God gave victory to his truth through Elijah that day when he was used to show God’s power on Mount Carmel. If we wish to be victorious along with God’s cause, we must stand boldly for the truth even in the face of powerful opposition. Silence will not get the job done when the truth is at stake. Why, this is a marvelous thing, that you do not know where He is from, and yet He has opened my eyes! Now we know that God does not hear sinners; but if anyone is a worshiper of God and does His will, He hears him. Since the world began it has been unheard of that anyone opened the eyes of one who was born blind. If this Man were not from God, He could do nothing (John 9:30-33). This man was not a fair weather supporter of Jesus Christ. He was ready to face the opposition and remain the truth regardless of the cost. Nevertheless even among the rulers many believed in Him, but because of the Pharisees they did not confess Him, lest they should be put out of the synagogue; for they loved the praise of men more than the praise of God (John 12:42-43). Their problem was not one of ignorance. They knew who Jesus was, but were to cowardly to confess him before others. What a shame it was that these people loved the praise of men more than God! It is a sad fact that some still do. If we are to serve God acceptably, we must realize our responsibility to stand for God and his truth regardless of the cost. At times, it will cost us as others ridicule, oppose and even denounce us. But we must always remember that unmoved. The power of the opponent did not make him fearful. His parents said these things because they feared the Jews, for the Jews had agreed already that if anyone confessed that He was Christ, he would be put out of the synagogue. Therefore his parents said, “He is of age; ask him” (John 9:22-23). They were cowards who issued their disclaimer to protect themselves from the Pharisees instead of standing for it is the ultimate praise of God that we seek, not the temporary popularity of this world. 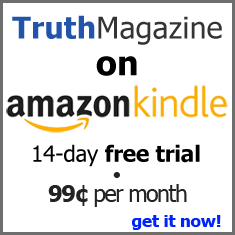 Like those of Bible times, we live in a world where standing for truth is not popular. In fact, it is so unpopular that we are sure to be opposed (2 Tim. 3:12). What should we do? Remain silent? Go along with the crowd? Issue a disclaimer to truth? No, we must “preach the word; be urgent in season, out of season; re- prove, rebuke, exhort, with all longsuffering and teaching” (2 Tim. 4:2). Those who justify sin and error will oppose us as will those who sit in silence. But God will bring us to victory with his truth in the end!